It also has Mediterranean diet cred, with olive oil, tomatoes, fresh bell bepper, feta cheese, and protein-rich chicken. To make this meal, simply saute the chicken in olive oil for 3 minutes per side. Then add the chopped onion and the next five ingredients, and stir, cover, and reduce heat. Simmer for 25 minutes or until the chicken is done. Sprinkle with feta cheese and serve with pasta. Easy! 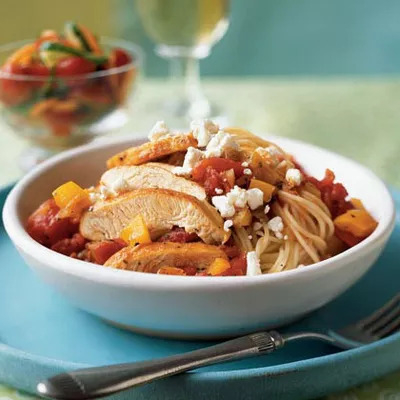 Ingredients: angel hair pasta, olive oil, chicken breasts, red onion, yellow bell pepper, fresh lemon juice, dried basil, dried oregano, canned tomatoes with basil, garlic, and oregano, feta cheese.